Nothing says Sunday lunch like some creamy red beans either as a side dish mixed with rice. I will share my delicious recipe with you, but you have to promise me you'll make it next Sunday! Adjust your slow cooker setting to high. Cover and let cook for 2 hours. After 2 hours, your beans should be soft enough that you can smash them between your fingers. Add 1 tbsps creole seasoning, 1 tsp black pepper and pour in the entire can of coconut milk. If you opt to use the hot smoked sausage, add the slices at this time. Cover and adjust your cooker settings to low. Cook for another 3 hours or until thick and creamy. Garnish with bay leaves and serve. At this time you may adjust your seasonings to taste. I like my beans spicy so I tend to go heavier with the creole seasoning if I'm making this dish just for me or persons who like spicy foods. If spicy is not your thing, the 2 table spoons will suffice. You may serve as a side by itself, mixed with rice or with a scoop of rice on top in typical New Orleans style. 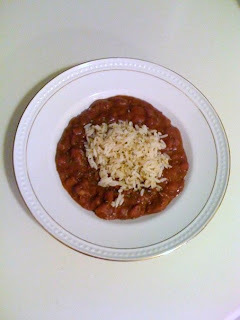 This recipe reminds me of a dish I had years ago when I visited Cuba. Nice recipe, thanks for sharing. This sounds yummy! I most certainly will try this next Sunday.